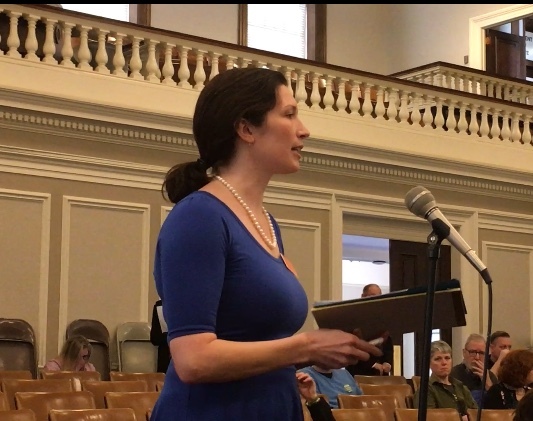 Sarah Mattson Dustin, director of policy at the New Hampshire Women's Foundation, is pictured testifying before the House Judiciary Committee at a hearing earlier this month on HB 1319. The New Hampshire Women’s Foundation invests in equality and opportunity for New Hampshire women and girls. We believe in social, political, and economic gender equality. We care deeply about the safety and freedom of all people, and are especially committed to lifting up marginalized communities that have historically experienced discrimination and violence. That is why we support HB 1319, which would ban discrimination based on gender identity in housing, employment, and public accommodations. Thousands of transgender people live and work in our communities. They are our neighbors, co-workers, friends, and family. Despite growing public awareness of gender identity and support for transgender people, they still face disproportionate rates of discrimination, harassment, and violence. That must change. Transgender women are women, and like all women we want them to be treated fairly in all aspects of their lives. Over the years, New Hampshire’s Law Against Discrimination has evolved to ensure that people don’t face discrimination because of who they are, resulting in protections against discrimination based on race, age, gender, and sexual orientation. These categories were specifically named because they have historically been used to stigmatize groups of people despite having nothing to do with a person’s inherent worth. It is long past time to update the Law Against Discrimination to include transgender people. Opponents of HB 1319 say they are concerned about safety and privacy in public bathrooms and locker rooms. As an advocate for women and girls, I want women and girls to be safe, too. But fear-mongering about public bathrooms and locker rooms is a smoke screen. Nothing in HB 1319 would change the fact that it is already illegal to assault a woman (or a man) in a public bathroom or locker room. Eighteen states and over 200 municipalities have prohibited discrimination against transgender people. Some of these anti-discrimination provisions have been on the books for decades. These jurisdictions have not experienced increases in harassment, violence, or any other public safety issues in public restrooms or locker rooms. Prohibiting discrimination does not weaken laws against assault, nor compromise their enforcement. Anyone who is concerned about public safety should be concerned about the fact that nearly one in two transgender people will be sexually assaulted during their lifetime. Forcing transgender people out of the facilities consistent with the gender they live every day makes them more vulnerable to harassment and violence, without making anyone else safer. We should instead seek to guarantee that transgender people can use the public facilities where they are safest – those consistent with the gender identity they live every day. Indeed, the New Hampshire Association of Chiefs of Police have endorsed HB 1319 because they understand that it will make all of us safer. The coalition supporting HB 1319 draws support from a seemingly endless list of allies, including the Business and Industry Association. Updating the Law Against Discrimination to include gender identity makes the law clear for landlords, employers, and people who manage public spaces. It improves public safety. It recognizes that transgender people routinely face discrimination in all aspects of their lives. It is simply the right thing to do. We call on our lawmakers to embrace the values of freedom and equal opportunity that Granite Staters hold so dear, and pass HB 1319 with bipartisan support.